Dining on delicious fresh fish and shellfish in Boston seafood restaurants can be a highlight of any visit to our waterfront city, and is an experience you should not miss! The truth is, we're blessed with some incredible chefs who turn our Boston seafood specialties into memorable feasts. Lobster, lobster rolls, luscious oysters from Duxbury's Island Creek and other New England locations, clam chowder - this is just a small taste of what they serve! Fortunately, almost every Boston restaurant serves seafood, and it's very good in most places. But why settle for just "good" when you can experience "great"? Here are my recommendations for the BEST seafood restaurants in Boston. You'll find a few of these top seafood restaurants listed in every Boston travel guide - but others fall into the "insider secret" category . 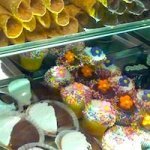 . . special local places you might not find on your own. What Makes Boston Seafood Restaurants "Great"? The absolutely MOST important thing that makes any seafood restaurant great is the quality - specifically, the freshness - of the shellfish and fish. The skill of the chef comes in at a close second. What about location . 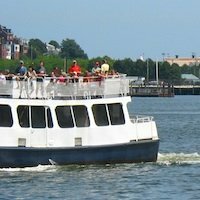 . . should you seek out a waterfront restaurant? Sure, if you want the view. However, you can find excellent seafood restaurants all over the city - so no worries about location. All restaurants listed on this page serve the very freshest, high quality seafood. All the chefs have formidable skills and talents. Only a few of the restaurants have waterfront locations - but all are excellent! This short list of recommendations includes some of Boston's best restaurants, period. Expect a memorable dinner! Even locals wait for hours to dine at small, unassuming Neptune Oyster, but your patience will be paid back the moment you taste one of the briny fresh oysters or bite into the succulent chunks of lobster meat overflowing your lobster roll. Great place to get a lobster dinner, Ipswich clams, P.E.I mussels, local fish, and grilled Maine lobster "clambake." A "must-try": the North End Cioppino. Neptune Oyster's outstanding raw bar always features plenty of varieties of oysters and other shellfish. For a lot of fans (like me! ), the lobster rolls take center stage. You get to choose: hot with butter and cold with mayo. Both rank high on my "best lobster roll in Boston" list. If you're watching carbs, order it as a salad on a bed of greens and skip the roll and fries. Neptune Oyster's menu lists most shellfish at "market price" - meaning that it depends on the cost of the seafood on the dock - lobster rolls run about $25. Order a beverage from the bar, take the first bite of your dinner, and you won't care about the size of your check. Dating from 1826, Union Oyster House holds the distinction of being both the oldest restaurant in Boston, and the oldest restaurant in continuous service in the U.S. - and, we can assume, the oldest Boston seafood restaurant. 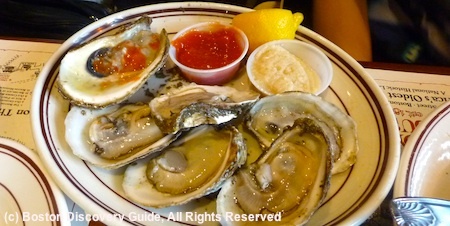 As you can guess from Union Oyster House’s name, oysters are a specialty . . . along with clams, shrimp, scallops, and other delectable local shellfish and fish. When you walk in, the first thing you'll see is the oyster bar - very casual, unassuming ambiance. But then the hostess takes you upstairs, and the gracious dining rooms lined with old pictures transport you back a couple of centuries. 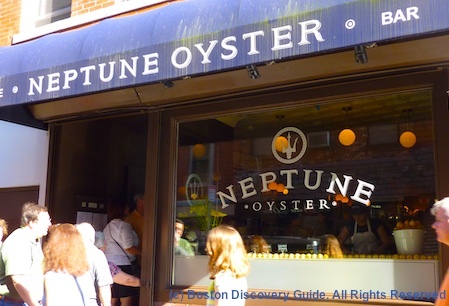 Located in the Historic Downtown neighborhood around the corner from Faneuil Marketplace, this Boston seafood restaurant is popular with tourists attracted by its history, and locals and other New Englanders who return again and again because of the food. Come for traditional local and New England specialties such as boiled lobster, shore dinners, broiled Boston scrod, and Boston cream pie. Personally, I can never resist their slightly non-traditional lobster roll and seafood pie. Here in Boston, we think of Legal Sea Foods as one of our premier seafood restaurants - but in addition to having a number of locations in the Boston area, it's also nationwide. Still, to us, Legal's (as we call it) is a favorite local spot to grab a quick bite (shrimp cocktail, or the shrimp Caesar salad), linger over a fancy celebratory dinner, and everything in between. Legal's motto sums it up: “If it’s not fresh, it’s not Legal.” Behind the scenes, they've invested a lot in securing reliable supplies of top-quality seafood. Legal Sea Foods' newest location, Legal Harborside, raises the bar for waterfront Boston dining and anchors a row of glittering new dining spots along the South Boston Waterfront overlooking the Harbor. Choose casual dining on the first floor, fine dining on the second, or head up to the third floor bar for drinks and unbeatable views. Legal Harborside offers a different menu than Legal Sea Foods, but some things such as their great chowder are the same. Both Legal Harborside and Legal Sea Foods offer a wide variety of seafood prepared in many different ways - something for every taste. The menu even includes a small "turf" section. Wondering How to Eat a Whole Lobster? If you’re planning to order a boiled or steamed lobster — the centerpiece of a New England lobster dinner, and a specialty in many Boston seafood restaurants — you may first want to check out my detailed instructions on how to eat a whole lobster. It's easy once you know how to approach it - but even if you're not sure, most waitstaff are happy to show you. Granted, O Ya isn’t a traditional Boston seafood restaurant since most of the premier-quality fish and shellfish in this innovative sushi restaurant aren’t cooked and the menu includes a lot of non-seafood items as well - but if you like top-quality sushi and sashimi so fresh you can taste the sea, you’ll want to add this locally renowned restaurant to your "must visit while in Boston" list. O Ya frequently tops "best Boston restaurant" lists. Although O Ya’s menu changes often to reflect seasonal and even daily availability of their top-quality ingredients, here is a sampling of what you might find: bluefin tuna nigiri with soy braised garlic and micro greens . . . bali-style scallop sashimi with coconut dressing, mint, and lime juice . . . and for those who want something other than seafood, chicken yakitori with celeriac puree and perigord black truffle . . . foie gras gyoza with sansho and pink peppercorns. For another treat, sample O Ya’s creative sake offerings. 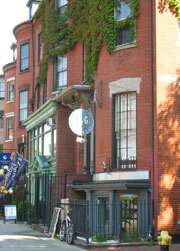 From the outside, there's no way to know that B&G is one of Boston's best seafood restaurants. Acclaimed chef/owner Barbara Lynch also happens to be a top Boston chef. You'll normally find at least 12 different types of raw oysters from both coasts available daily - you’ll see them written on a board. Even though the small restaurant comes across as simple and unpretentious, this is a connoisseur's dream, with a daily menu based whatever the freshest seafood and locally-grown produce happens to be each day. In addition to the succulent oysters, you can also choose other appetizers featuring fresh shellfish - or move on to the fabulous lobster rolls, totally delicious seafood entrees like monkfish wrapped with smoked pancetta and fried local clams, and dessert. Oh, and great wine. The small but carefully chosen wine list features mostly whites plus a few reds - ask the knowledgeable staff about the best pairings. Best seats: The shady back garden during warm weather, and the bar anytime, due to great views of the open kitchen. The trip from Island Creek Oyster Farm in Duxbury, just south of Boston, to the plate in front of you is a short one, and you can taste the freshness and quality in the deep-cupped mollusks, delivered straight to Island Creek Oyster Bar's Chef and Part-Owner (along with Skip Bennett) Jeremy Sewell by his cousin Mark, owner of the oyster farm. The menu mostly changes daily, based on what's fresh - but there's always an excellent selection of oysters and other shellfish, their really, really good lobster roll on a rosemary bun, a seafood casserole, a few local clam specialties, and a small selection of fish main dishes. Island Creek Oyster Bar opened in the fall of 2010, almost instantly became wildly popular, and still remains packed at most times. Definitely make a reservation. We usually stop by for a late lunch rather than dinner, but the menu is more limited. They also serve brunch, which usually includes a couple of tasty options, such as a sausage biscuit and gravely with a crispy oyster and fried egg, a lobster omelet, and salt cod cakes with poached eggs. Who says you can't serve some of the best seafood in Boston while also providing a fun, casual environment? If these restaurants remind you of shore-side clam shacks, your aunt's kitchen, even a picnic - well, that's part of the fun! 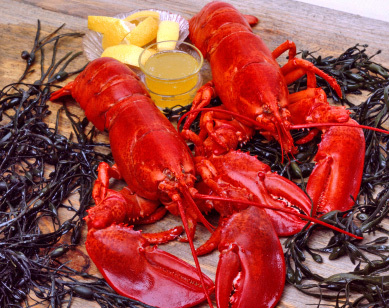 So get ready to relax, have a great time, and enjoy some great Boston seafood dinners! 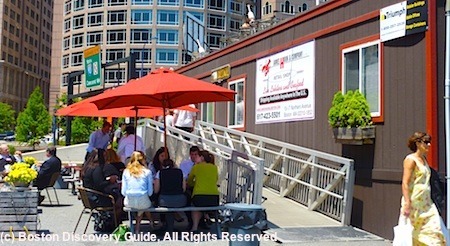 To experience quintessential New England clam shack food without actually leaving the city, this fun and casual Boston seafood restaurant - the creation of Jasper White, one of the city’s best known seafood chefs - is the place to do it! You’ll see a huge raw bar case full of succulent shellfish . . . but most important, you’ll love the food. Summer Shack is one of my family’s favorite places in the city because of - not necessarily in this order - the boiled lobster, lobster rolls, clam chowder, corn dogs, corn on the cob, fresh fish daily specials, the grilled seafood, the raw bar, bouillabaisse, the fish sandwiches, fish and chips . . . well, you get the idea. 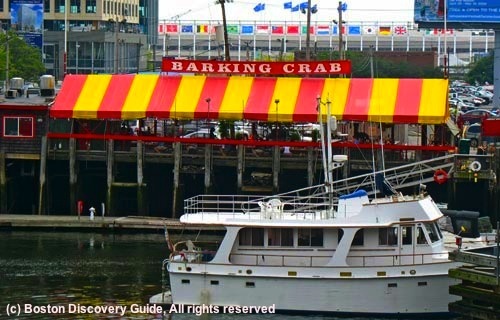 The Barking Crab, located on the Fort Point Channel and overlooking Boston Harbor, takes the clam shack concept even farther. Diners sit at picnic tables under a red and yellow striped tent and enjoy some of the city's freshest seafood as well as prime waterfront views. But that's just the beginning of the fun at this popular Boston seafood restaurant. . . 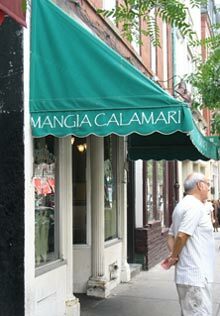 Locally known as "The Calamari Place," this small - 6 or 7 tables - casual family-run Sicilian restaurant specializes in the very freshest Boston seafood - and especially calamari, which is the Italian word for squid. Dishes are cooked to order - think of it as home cooking - and many are served in iron skillets. The Daily Catch is a great place to go if you want to relax over a leisurely meal and don’t mind waiting if a table isn't immediately available. Despite the tempting fish and other shellfish choices, I love their fried calamari with lemon and almost always order that . . . but bites from dining companions’ skillets confirm that everything is delicious. At the tiny North End location, getting a table can take awhile if you arrive at a busy time, especially on the weekends. Go with a total of 4 or fewer people. Avoid the busiest times, like noon-1pm or 6-8pm. If we see a long line, we detour to one of the North End's fabulous bakery/cafes for espressos and perhaps biscotti, and then come back later. 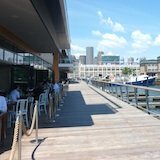 The Seaport District location on Northern Ave is larger (and has fabulous waterfront views), but these tips are probably useful there as well. James Hook isn't a seafood restaurant - it's primarily a wholesale operation that ships 50,000 pounds of lobster daily to Boston restaurants and wholesale distributors around the country. However, they do run a small retail business from a trailer where you can buy live lobsters and delicious carryout dinners. It's also one of the best - and at about $12 ($15 for large), possibly the cheapest - places to get lobster rolls in the city. They also have a few other carryout items such as clam chowder, lobster bisque, and occasionally clam and crab rolls, but I always get the lobster rolls - chunks of sweet, fresh-picked lobster, a little mayo and chopped celery - perfection! James Hook is carryout only, although they do provide a couple of picnic tables next to the trailer, and you'll also find plenty of other park benches and low walls in nearby areas. New Jumbo Seafood specializes, not surprisingly, in fresh seafood - "fresh" as in alive when you order it (you'll pass by the tanks when you walk in) , and sometimes presented for your inspection before being cooked. Basically, the "fresh" seafood consists of 4 choices: fish, crab, eel, and lobster. The menu offers several cooking styles such as ginger-scallion and steamed with minced garlic, but you can also order off-menu if you want something different - easiest to do this if you speak a few words of Chinese. The long menu also lists plenty of other fish and shellfish dishes prepared in whatever way you want. . . but if you want something else, just ask. Of course, you can enjoy many other popular as well as less well known Chinese dishes here as well. Like most Chinatown restaurants, New Jumbo Seafood is casual and often crowded - you'll see groups of friends and large family gatherings, as well as tables with just one or two people. If you come, you'll have a good time and some great Boston seafood - Chinese style! 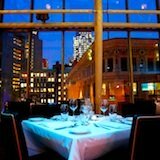 Although Grill 23 emphasizes prime dry-aged beef, this is also a great place in Back Bay to get casual seafood, such as a large boiled Maine lobster or a juicy swordfish steak. If you’re a seafood lover, you’ll enjoy Grill 23's nice raw bar and seafood appetizers. If you crave fish but are heading out to dinner with someone whose heart is set on beef, you’ll both be happy here. Come with a hearty appetite because portions are big! The 1,000+ selection wine list is sure to enhance your experience. 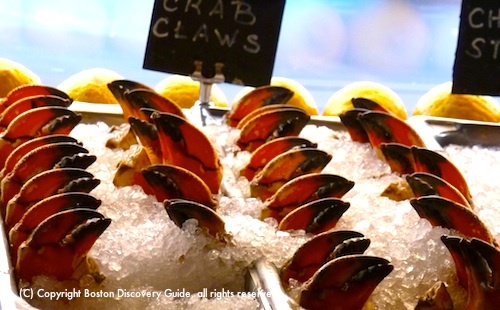 What specialties will you find in Boston seafood restaurants? Clam chowder is a special treat. Don't expect to find the tomato-based red kind that you might find elsewhere. In Boston, we prefer New England clam chowder, featuring a milk or cream base that enhances the delicate flavor of local clams. Where will you find the best clam chowder? Hmmm . . . everyone has their own opinions about this! You'll have to sample the chowder at a lot of different places and form your own opinion. Don't overlook other fish chowders and lobster bisque - those are also fabulous here. And remember, almost all Boston restaurants, even if they don’t specialize in seafood, usually feature fish and shellfish in at least a couple of their main courses. Even most steakhouses include a “surf” section in their menus.